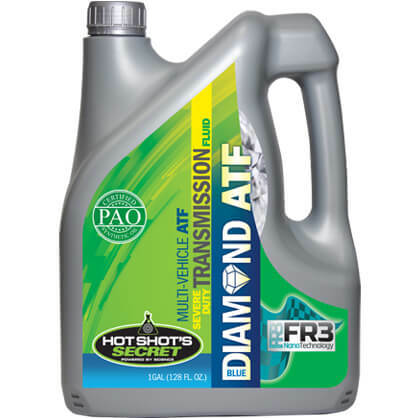 ATF: BLUE DIAMOND MULTI-VEHICLE ATF SEVERE DUTY TRANSMISSION FLUID is recommended for multi-vehicle applications (see below). TF/C4: BLUE DIAMOND FORD TYPE F & ALLISON C4 SEVERE DUTY TRANSMISSION FLUID is recommended for extreme horsepower applications, as well as Ford Type F & Allison C4. was formulated for severe-duty applications. The formulas are based on 100% poly-alpha-olefin (PAO) Group IV and high-quality Group V synthetic oils, infused with our FR3 Nano Technology, that protects against the major causes of transmission breakdown and helps extend transmission life. BLUE DIAMOND SEVERE DUTY TRANSMISSION FLUID also provides increased oxidation resistance, thermal stability, deposit and sludge prevention, reduced breakdown, longer drain intervals and higher wear resistance than competitors. BLUE DIAMOND SEVERE DUTY TRANSMISSION FLUID is for use in automatic transmissions where heavy loads and challenging terrain place a high demand on transmissions. I know Blue Diamond Multi-Vehicle ATF Severe Duty can replace Mercon LV. Is it also safe to use the Blue Diamond TF/C4 in place of Mercon LV? I’ve been using Stiction Eliminator, Extreme Diesel, EDT & FR3 and I’m very impressed with the results and performance of my truck after using these products. No, unfortunately only Type F Ford transmission fluids. Thanks for all the feedback!! I have a 2012 ram 2500 6.7 Cummins 4×4 With a 68RFE transmission can I use the multi vehicle transmission fluid to Replace ATF +4 ? Yes Andrew! Our Blue Diamond Severe Duty Transmission Fluid ATF is a fuel efficient version of the ATF+4, so you may use it in the 68FRFE. Our Blue Diamond Multi-Vehicle ATF meets the requirements of the Ford Mercon LV transmission fluids. The 4R100 requires a Mercon V fluid. These two fluid types are incompatible and Mercon LV is NOT backwards compatible, so I would not recommend using our Blue Diamond Multi-Vehicle ATF for this application.